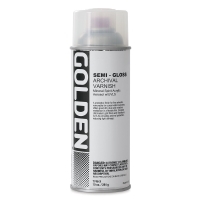 Golden Archival Spray Varnish provides a protective finish layer for fine artwork created with a wide variety of mediums, including acrylics, oils, pastels, watercolors, temperas, and inkjet prints. It offers excellent dirt-, dust-, and moisture-resistance, and is removable for conservation purposes. It contains ultraviolet light filters and stabilizers (UVLS) to provide archival protection and inhibit light damage. The adjustable fan spray tip allows for precise application with reduced overspray. Note — When using this product as a final varnish for oil paintings, allow at least 6-12 months for the paint film to cure before application. Heavy layers of varnish on fresh oil paint can impede the oxidation process and result in failure. However a light layer may be applied as a temporary varnish when the oil paint film is touch-dry.